Tyoga Kwaghhar Michael is an entrepreneur, a Farmer and educationists. 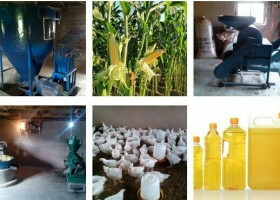 He has several years of experience in Agro-Allied industries, animal husbandry and education. He Studied Biology from Benue State University, P.G.D.in Education from National Teacher’s institute Kaduna and M.Sc Medical Microbiology (in view) at Federal University Makurdi. He is a certified youth innovative entrepreneur (YIEDP) by CBN-NYSC-HB, aimed at transforming ordinary citizens into economic value creators and has a certificate in Entrepreneurial Management at Enterprise Development Centre of Pan-Atlantic University Lagos, through Diamond bank BET6. He is a winner of the famous CBN-NYSC venture price award 2012 for future youthful vibrant entrepreneurs. Tyoga Kwaghhar Michael currently reside in Benue State, Nigeria. He is putting together a cooperate integrated farming system of Crop production, Agro-allied processing and Animal husbandry. His business anchor is geared towards growing the economy to achieve the standard of living and quality life aspire by the nation , now and the future , a growth that create jobs and does not compromise the safety of our environments.